Budapest the pearl of the Danube – as it’s often referred to – would have to be the most underrated city in Europe. Even if you have limited time it’s still quite possible to see a lot in 24 hours in Budapest. I found myself in this exact situation after missing a flight that affected my original plans for Budapest, leaving me with only one day. That’s all it took really, 24 hours and I was hooked! Once you discover Budapest you will be yearning to go back and explore this truly amazing city with a lot more time on your hands. Budapest flanks either side of the Danube in spectacular fashion. The view down the Danube from any vantage point is scenic and picturesque and even more so at night. Often referred to as the “pearl of the Danube” Budapest has many beautiful Art Nouveau buildings and interesting architecture at every turn. Lots of monuments to see, over 100 natural hot springs servicing the thermal baths and delicious Hungarian food! This place is a photographers dream, even the ruins left over from the destruction of WWII cannot hide the beauty within. Take a stroll through the beautiful parkland of Gellert Hill. It offers the best views of the Danube and Budapest below. At the summit is the Citadella Fortress and the Liberty Statue. Get your cameras out for the panaromic view of Budapest, as there are lots of vantage points throughout the park. Take the trail that begins not far from the Gellert Hotel. It is a little steep but it is worth the climb and there are many areas to stop and rest along the way. I actually wandered about all morning in this area and found lots of interesting statues along the way. At the summit there is a cafe and lots of markets stalls near the citadel. If you wander further along you will find the Garden of Philosophy or the sculpture titled “Buda and Pest Prince Princess” with the view as a backdrop. Gellert Park is very large but if you spend some time wandering around you will find some amazing sites, some quirky and others offering a grand view point. Buda Castle is a must area to visit. Formerly the Hungarian Royal Palace which was stripped of its royal trappings during WWII, very little remains on the inside that would hint of its former glory. The buildings themselves are still impressive and the courtyards are open 24 hours a day. The actual castle houses the Hungarian National Gallery, the Budapest History Museum and the Szechenyi Library. Throughout the year there are various festivals held here such as the Wine, Beer, Chocolate, Renaissance and Medieval, and Palink and sausage festivals. If you think this building might look familiar then you may have seen it in Katy Perry’s music video Firework which was filmed in Budapest. 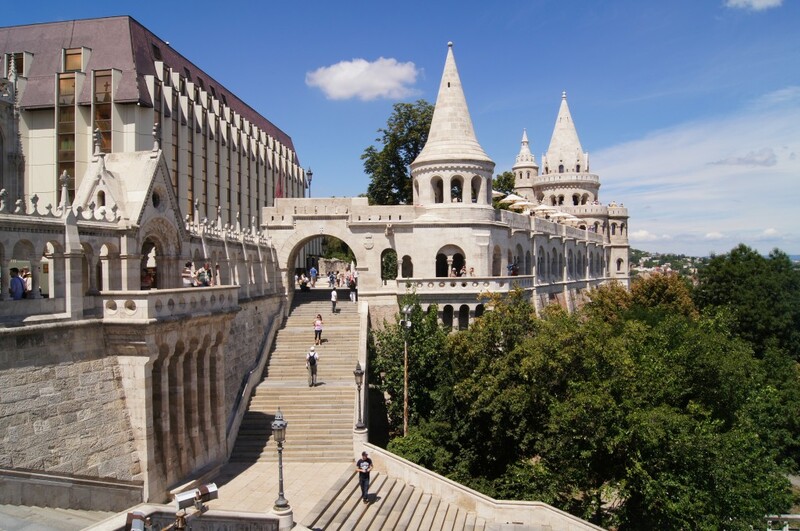 Fisherman’s Bastion, built in neo-gothic and neo-Romanesque style, boasts a panoramic viewing terrace with fairy tale towers. 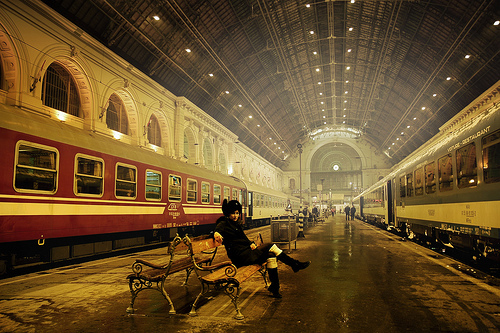 This attraction is the top tourist destination in Budapest. The balconies are free to explore and take photos from, the turrets attract a fee but both offer great panoramic views of the Danube, Margaret Island, Pest and the Gellert Hill. There is also a cafe on the Terrace that takes in the lovely views while live musicians create a magical atmosphere. This is a UNESCO World Heritage Site. Not far from the Fishermans Bastion is the Chain Bridge. A suspension bridge over the Danube that links the Buda side with Pest. Constructed of cast iron, the bridge features guardian lion stone statues at each abutment. Walk across the Chain Bridge and then wander into the city on the Pest side for a bite to eat in a Hungarian restaurant. Try some strudel, goulash and have some Hungarian wine too! The romantic Vajdahunyad Castle was built in 1896 and is located in the City Park by the boating lake. It showcases different architectural styles over the centuries in Hungary featuring styles from the middle ages to the 18th century. The courtyard is free to visit and open 24 hours. Recharge your batteries, sooth your joints or just cool down or should I say heat up after your day! The Szechenyi baths is the largest medicinal bath in Europe and is supplied by two thermal springs. Water temperatures are from 27 to 38 degrees celcius. This is another very popular tourist destination but also filled with locals as well. All ages can be seen here from the very young to the elderly. A popular past time or perhaps now a tradition with the elderly local men, is to play chess at the baths. If you fancy yourself as a chess player then maybe challenge these masters to a game, you may not win but will have a tale to tell! Walk along the promenade at night and you will be rewarded with a beautifully illuminated city which is nothing short of spectacular! If you are feeling a little tired from your day, then a river cruise would be a perfect way to take in the city at night whilst resting your feet. Wonderful photo opportunities on either side of the Danube and the city can be seen beautifully reflected on the water too. You may have photographed this beauty from a distance but if you want to be truly stunned by the lavish ornate interior architecture then the Hungarian Parliament building would be an absolute must see. The facade has 90 statues, the interior walls are decorated with 40 kilograms of 22 carat gold and a further 152 statues, it also houses the Hungarian Crown jewels, which date from around 1000 AD. An open air museum of the former communist regime. Featuring communist statues and monuments that were immediately removed from the city when communism fell and then later brought to the specifically designed park. The park is about dictatorship with imposing statues of Lenin, Marx and Engels along with other communist leaders of Hungary. The park is located a fair way out of the city and there is a small entrance fee. Gelarto Rosa for the best icecream in town! Hungarikum Bisztro for a hearty Hungarian meal and wine.